Save the date and join us at the DuPage Democrats Annual Gala Sunday April 7th at the Drury Lane! 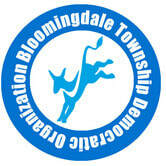 Bloomingdale Township Democrats and looking to have a table - if you are interested in joining us contact us today! Join us Thursday May 2nd from 6:30-9 for appetizers, drinks and trivia as we battle it out to see which township possesses the most political knowledge!